Review: The Specialized Langster steel is a classic track bike frame which might appeal to a commuter wanting a classic style track bike. For a long time, I have toyed with the idea of a single speed for commuting, so was keen to test out different options. I did really enjoy riding the bike. I loved the feel and comfort of the steel frame and steel fork, it seemed to absorb a lot of the (innumerable) potholes and rivets in the Oxford roads. It’s a long time since I have ridden a steel frame and it reminded me of why steel is still attractive as a frame material and has advantages over Aluminium. For racing, I’m not really interested in a comfortable ride, but for commuting – when I’m carrying a laptop – an absorb ale steel frame would be a real boon. With a Reynolds 520 Chro Moly steel frame, the bike is not light. It weighs approx. 23.5lbs (10.7kg) which to some extent defeats one of the attractions of being single speed.Nevertheless for commuting, weight is not such a big problem. Even with single speed it felt fairly easy to accelerate away and didn’t feel much different to my trek Aluminium. With a 42 Chain-ring, 16 rear cassette, I sometimes spun out (needed bigger gear) but only rarely. I don’t tend to race around the city too much. The other aspect of the bike is that it is a track size and uses track handlebars. For me, this doesn’t work for a commuting bike. It is quite an aggressive racing position, but I don’t want this when commuting. Also the brakes are on the top of the handlebars so it takes a while to move from the drop position to get the brakes on top of the handlebars. The brakes (Light dual pivot brake) have great stopping power, but, they seemed to lack a certain finesse. This is due to the small size of the brake levers. When commuting and riding, it’s nice to be able to lightly apply brakes ‘feathering’ to gradually slow down. With these brakes it felt like all or nothing. I don’t like the look of the saddle, it reminds me of some kids bmx for some reason, however, it is very comfortable. Rear of bike. Bolts make changing a wheel more difficult, though also makes it more difficult for thief to steal an unlocked wheel. The steel frame and fork was a joy to ride. It would make a good track bike, though if you’re going to get a track bike it might as well be fixed rather than just single speed freewheel. It doesn’t work as a commuting bike for me. I’m not keen on brakes and position of track bars. Also I would want eyes in the rear of frame for pannier rack and mudguards. Like any single speed you do tend to feel you pay a little more for what you get. At £539 it’s not the cheapest way to get a 10Kg bike. 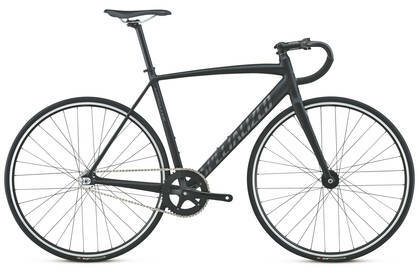 Since this initial review, Specialized have updated the Specialized Langster. It now comes with a lighter Aluminium frame, and a carbon fork to give improve comfort and quality of ride. If less ‘romantic’ than an old steel bike, it is probably more practical and a sign of the times that this is better selling material. It is £550 at Evans Cycles and I think that is reasonably good value for a good single speed. A very smooth ride Though there are quite a few cheaper alternatives on the market. It can be adapted to both the road and track. If you’re riding track, you can take off the brakes. If you’re riding on the road, you can add bar tape and bar plugs for extra comfort. thanks to Beeline bicycles Oxford for test ride.